Spot Landing is one of the events in the Hyperflite Skyhoundz DiscDogathon Championships (DiscDogathon Qualifiers, DiscDogathon International Qualifiers, DiscDogathon European Championship, and the DiscDogathon World Championship). 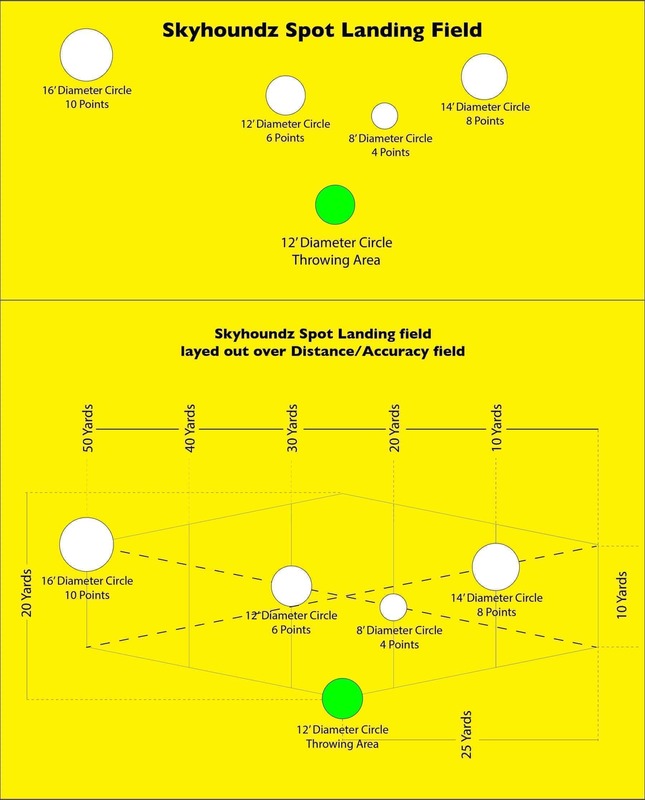 Spot Landing challenges competitors to complete as many catches as possible in the designated scoring zones within the time allotted. To give you an idea of what Skyhoundz DiscDogathon Spot Landing looks like, here is a video of Dean Werts and Player at Academy Dog Sports in Alpharetta, Georgia. Scoring zones and field dimensions are depicted in the graphics above (click to enlarge). 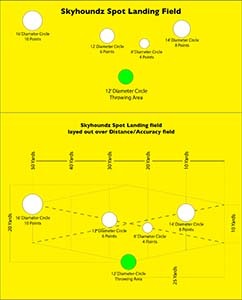 The Spot Landing field was designed so that it is easily reproducible and consistently set-up from DiscDogathon to DiscDogathon. The X-pattern on the lower diagram represents tape measure(s) or string(s) used to help locate the "vector points" upon which the scoring zones are centered.